It does not happen often a James Bond movie to rely heavily on its predecessor and this is exactly the case with 2008's Quantum of Solace. The previous installment in the series, 2006's Casino Royale, was the first Bond film starring Daniel Craig and it was a big success among both critics and broad audience. Probably this has been the reason inciting Quantum of Solace's filmmakers to include so many references in the movie to the former one but unfortunately, the end result is not even close to the quality of Casino Royale. 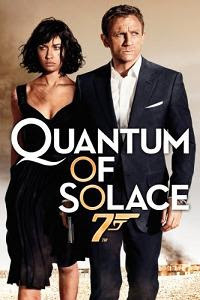 In Quantum of Solace secret agent James Bond (Daniel Craig) has to stop a famous environmentalist (Mathieu Amalric) from gaining control of a sterile land in South America in exchange of helping a local military leader to take the rule of the country. Simultaneously, Bond is hoping to inflict vengeance upon the people involved in the death of his love interest from Casino Royale Vesper Lynd. Of course, there is a new girl here, Camille (Olga Kurylenko), who is also seeking revenge for past events. The CIA is completely lost in this film and Bond's most powerful weapon is his strong will to avenge for Vesper's death. Quantum of Solace is interesting in its contradictions. It is the first Bond Movie referring so heavily on a previous installment and in the same time it is very different from Casino Royale. The character development and the absorbing story of the first film with Daniel Craig are missing and the movie is closer to the usual stereotype of the franchise offering an invincible and almighty James Bond. Naturally, this does not make the film really memorable but the worse is the movie lacks a good plot and interesting twists. The aforementioned references to Casino Royale are also more obstructive to the story perception instead of being helpful in any way. As a good old-fashioned James Bond movie Quantum offers lots of intense action, special effects and unscrupulous villains. Its biggest problem is that many of the previous films in the Bond series are just better. We've seen better plots, more efficient villains and we've listened to better scores. Even the opening song here is quite weak and in my opinion unsuitable. At the same time many of the franchise's past opening songs have become huge hits. Finally, the movie does not surprise with anything and is completely predictable. So, if you want to see a traditional James Bond film you have plenty of options among the vast collection of pre-Daniel Craig Bond episodes. If you want to see something different Casino Royale is the obvious choice. These make the second Daniel Craig's reincarnation as James Bond actually expendable. If you are a fan of the James Bond franchise, you can see Quantum once for completeness but except for this purpose there are not many reasons to choose it. There is still hope though that the upcoming release of Skyfall is going to change the notion of a Bond movie for good once more and we will have the chance to experience a high-grade entertainment with Daniel Craig in the cinema again.